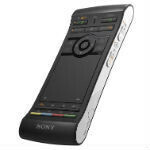 One of the better features about the Sony NSZ-GS7 Google TV box that came out last year was the remote, which offered a touchpad on the front, a full QWERTY keyboard on the back, and motion controls. Now, Sony has shown off the new version of that remote at CES. It looks just like the old remote, but it comes with one major new addition: a microphone for voice command. Voice command is one of the newer features of Google TV that Google wants to really push. It uses the same system as Android, and allows you to easily launch apps, search for content, or change channels (if you're on Dish Network). To take advantage of that, Sony will be releasing the updated version of the remote, which seems to be the same as the old one, except that now there is a microphone, and a dedicated voice command button. No word on any other changes, pricing, or release info. All we know right now is that it will be released sometime this year. We should know more later this week, and we'll pass it along. I have the old remote & it would be GREAT to have the updated new remote. I bet they will sell the existing customers the new remote at a cheaper price point since we already own the Sony NSZ-GS7 Google TV box. P.S. That remote is so bada$$. It just works so well. A perfect complement to Google TV.